TS Earl in the Caribbean Sea headed for Belize and Mexico. 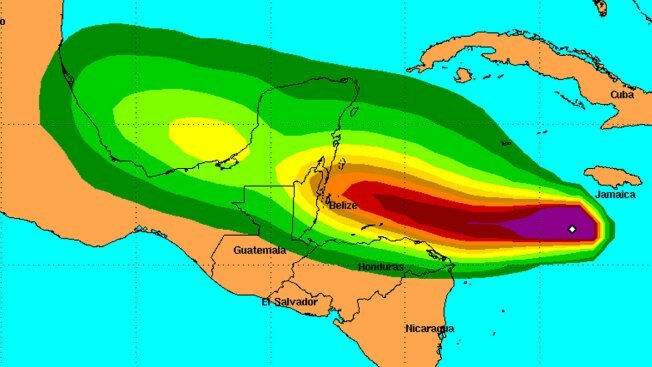 A weather system that already has caused at least six deaths in the Dominican Republic has been designated Tropical Storm Earl. The U.S. National Hurricane Center in Miami said Tuesday that Earl was threatening to bring heavy rains, flooding and high winds to Mexico, Belize and Honduras. All three of those countries issued Tropical Storm warnings for some areas, and a hurricane watch was issued for part of the Mexican coast. On Sunday, Earl was still a weaker tropical wave but knocked down power lines and started a fire that killed six passengers on a bus filled with people returning from a beach excursion. On Tuesday, the storm was centered about 535 miles (860 kilometers) east of Belize City in the Caribbean. It had top sustained winds of 45 mph (75 kph) and was speeding west at 22 mph (35 kph).